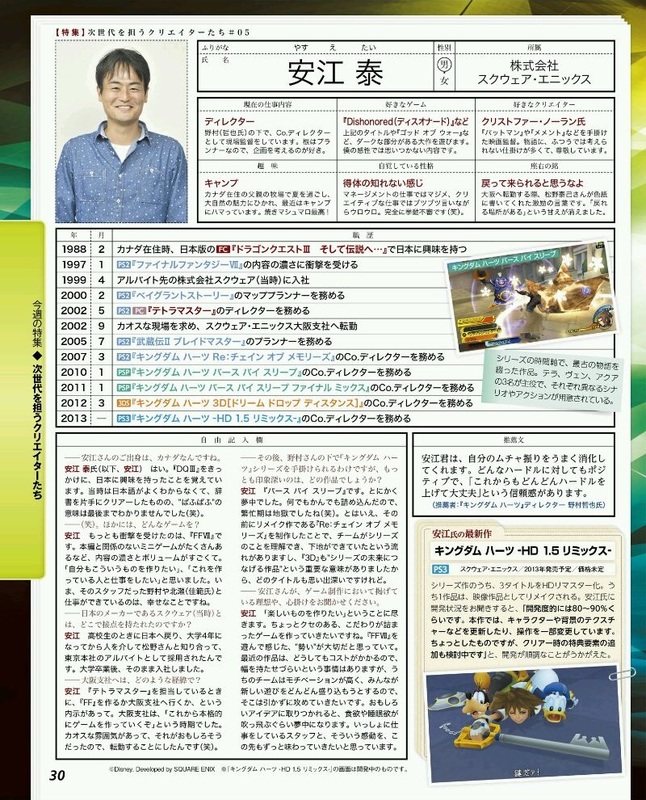 Kingdom Hearts 1.5 HD ReMIX has been featured in the November 22 issue of Famitsu. Thanks to hokanko-alt for the information and to SQEXGAL for translating it, it states that the game is now 80-90% complete and the development team is looking to add a special feature for when you clear it but it will not be a secret movie. We will keep you posted if and when more information has been released. —Moving on from that, with you working on the Kingdom Hearts series under Mr. Nomura, which title left the deepest impression on you? Yasue: Birth by Sleep. It was like being in a dream. We packed in everything under the sun, so the busy period was hell (laughs). That said, having produced the remake title Re:Chain of Memories before that meant my team understood the series and things went along with the groundwork having been laid, and 3D was an important title that ‘connected to the future of the series’, so I have strong memories of all the titles. —Mr. Yasue, please tell us the ideals you uphold and the points you take care with when producing games. Yasue: I do everything I can to create something fun. I want to make games that are packed with a particular characteristic style. I think that the ‘energy’ I felt playing FFVII is important. With our recent titles it has been difficult to leave wiggle room because it always comes at a cost, but everyone on my team is highly motivated to incorporate new gameplay, so that’s an area we attack without pulling any punches. When we get obsessed with an interesting idea, we get so wrapped up in it that we even lose our appetite for food and sleep. I want to always relish that feeling with my fellow staff.